Eta Carinae is a mysterious, extremely bright and unstable star located a mere stone's throw - astronomically speaking - from Earth at a distance of only about 7,500 light years. The star is thought to be consuming its nuclear fuel at an incredible rate, while quickly drawing closer to its ultimate explosive demise. When Eta Carinae does explode, it will be a spectacular fireworks display seen from Earth, perhaps rivaling the moon in brilliance. Its fate has been foreshadowed by the recent discovery of SN2006gy, a supernova in a nearby galaxy that was the brightest stellar explosion ever seen. 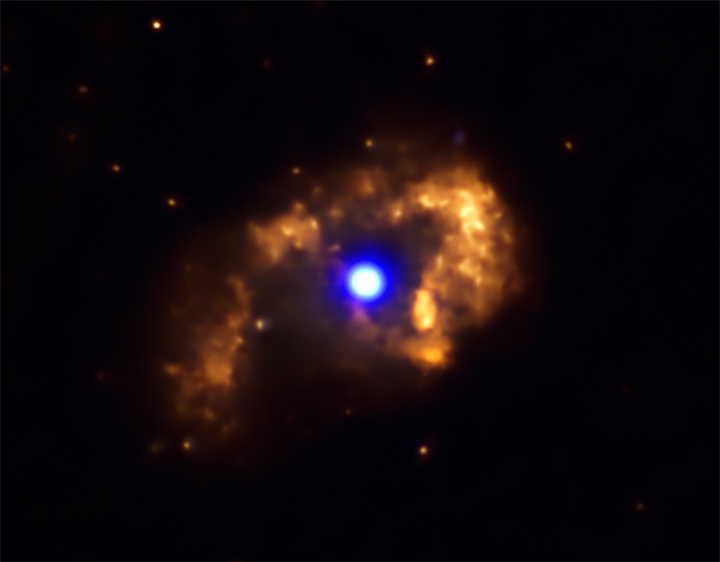 The erratic behavior of the star that later exploded as SN2006gy suggests that Eta Carinae may explode at any time. Eta Carinae, a star between 100 and 150 times more massive than the Sun, is near a point of unstable equilibrium where the star's gravity is almost balanced by the outward pressure of the intense radiation generated in the nuclear furnace. This means that slight perturbations of the star might cause enormous ejections of matter from its surface. In the 1840s, Eta Carinae had a massive eruption by ejecting more than 10 times the mass of the sun, to briefly become the second brightest star in the sky. This explosion would have torn most other stars to pieces but somehow Eta Carinae survived. The latest composite image shows the remnants of that titanic event with new data from NASA's Chandra X-ray Observatory and the Hubble Space Telescope. The blue regions show the cool optical emission, detected by Hubble, from the dust and gas thrown off the star. This debris forms a bipolar shell around the star, which lies near the brightest point of the optical emission. This bipolar shell is itself surrounded by a ragged cloud of fainter material. An unusual jet points from the star to the upper left. 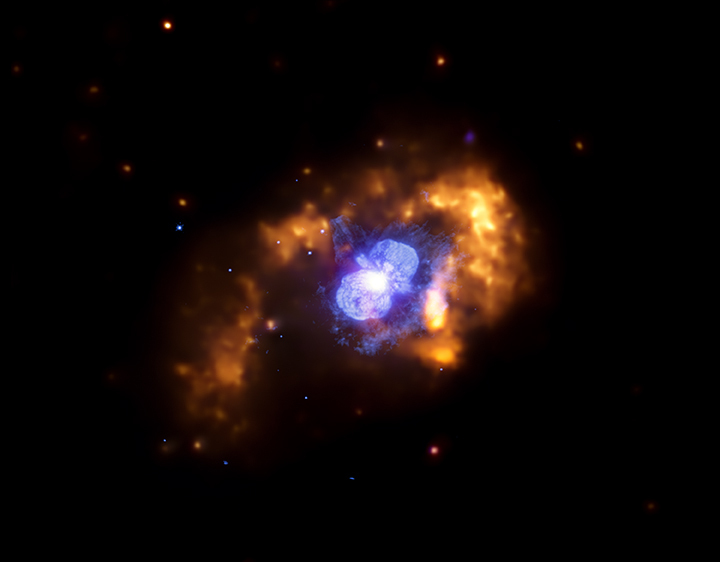 Chandra's data, depicted in orange and yellow, shows the X-ray emission produced as material thrown off Eta Carinae rams into nearby gas and dust, heating gas to temperatures in excess of a million degrees. This hot shroud extends far beyond the cooler, optical nebula and represents the outer edge of the interaction region. The X-ray observations show that the ejected outer material is enriched by complex atoms, especially nitrogen, cooked inside the star's nuclear furnace and dredged up onto the stellar surface. The Chandra observations also show that the inner optical nebula glows faintly due to X-ray reflection. The X-rays reflected by the optical nebula come from very close to the star itself; these X-rays are generated by the high-speed collision of wind flowing from Eta Carinae's surface (moving at about 1 million miles per hour) with the wind of the companion star (which is about five times faster). The companion is not directly visible in these images, but variability in X-rays in the regions close to the star signals the star's presence. Astronomers don't know exactly what role the companion has played in the evolution of Eta Carinae, or what role it will play in its future.